The German occupation of Luxembourg lasted from 1940 until 1944. 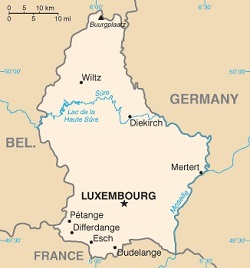 The Grand Duchy of Luxembourg -- Groussherzogtum Lëtzebuerg in Luxembourgish, Grand-Duché de Luxembourg in French, Großherzogtum Luxemburg in German -- is a landlocked country in Western Europe, between Belgium, Germany, and France. It is the World's only remaining sovereign Grand Duchy. Luxembourg is a trilingual country, with German, French, and Luxembourgish being the official languages. Siegfried (922-998), Count of Ardennes, acquired the land that was to become Luxembourg in 963, and he began the construction of a fort, which would eventually become Luxembourg Castle. A town gradually developed around the fort, which became the center of a small state with great strategic value. During the Middle Ages, three members of the House of Luxembourg would become Holy Roman Emperors. This town, was steadily enlarged and strengthened by successive inhabitants, including the Bourbons. the Habsburgs, and the Hohenzollerns. After the defeat of Napoleon in 1815, the Congress of Vienna formed Luxembourg as a Grand Duchy in union with the Netherlands, with the King of the Netherlands being the head of state. In 1890, Luxembourg gained its independence from the Netherlands, and it has been a sovereign Grand Duchy since then. The overprinted German definitive stamps shown above were issued on October 1, 1940, after the German occupation of Luxembourg. 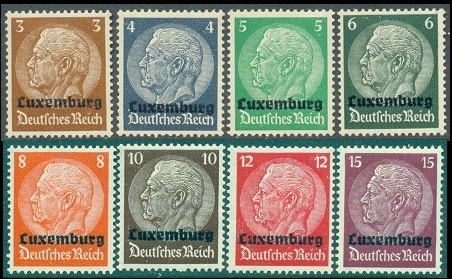 The overprint "Luxemburg" was applied to the Germany 1933 Hindenburg definitive issues, which were perforated 14 x 14 1/2 and watermarked swastikas. All of the stamps, except for the four high-denominations, are shown in the images above (Mi. #1-16, Sc. #N1-16). 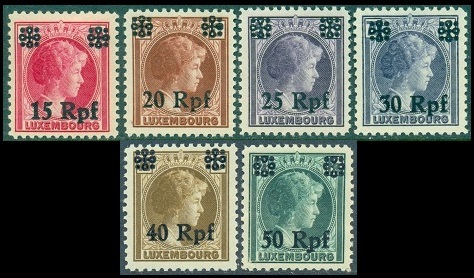 On December 5, 1940, the contemporary postage stamp issues of Luxembourg were re-valued in Reichspfennig, as shown above (Mi. #17-32, Sc. #N17-32). The lower denomination stamp designs all depict the portrait of Grand Duchess Charlotte, who had been forced into exile in the United Kingdom, during the war. The three high value pictorial definitives feature an Allegory of Medicinal Baths, the Gate of Three Towers, and a view of a Castle from the Our River Valley. On January 12, 1941, the 1938 Third Reich Winter Relief set shown above (Mi. #33-41, Sc. 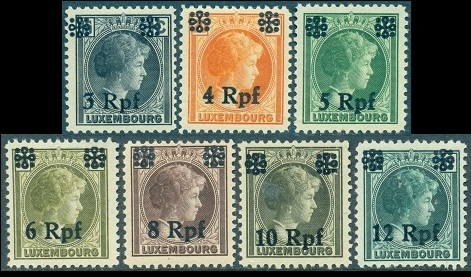 #NB1-9) was overprinted "Luxemburg". I imagine the surtaxes on these postage stamps went towards Winter Relief programs in the German occupation territory. Luxembourg attempted to maintain its policy of neutrality that had been in effect since 1867, but due to its strategic location on the invasion route into France, this was not successful. In World War I, Luxembourg was invaded and occupied by Germany, but the country was allowed to maintain its independence and political mechanisms. The Third Reich treated Luxembourg as a Germanic territory and formally annexed it in 1942. From 1942 through 1944, postage stamps of the Third Reich were used in Luxembourg. Luxembourg was liberated by Allied troops in September 1944, not too long after the Battle of the Bulge was fought in some areas of Luxembourg territory. When Allied troops entered Luxembourg City on September 10, 1944, the German army retreated, with no resistance.